Making bread without bread maker or oven. I only use the pan. 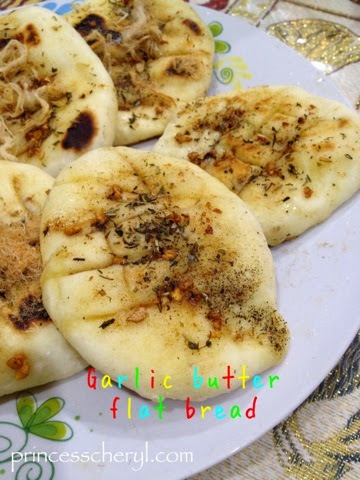 Garlic butter flat bread. Taste like naan. Original recipe from my favorite celebrity chef Jamie Oliver. But I exclude the baking powder (forgot to re-stock). 1. Add all the flatbread ingredients to a mixing bowl and mix together with a spoon, then use clean hands to pat and bring everything together. 2. Dust a clean work surface with flour, then tip out the dough. 3. Knead for a minute or so to bring it all together (this isn't a traditional bread recipe, so you don't need to knead it for long – just enough time to bring everything together). 4. Put the dough into a floured-dusted bowl and cover with a plate, then leave aside. 5. If making the garlic butter: peel the garlic cloves and crush them with a garlic crusher. 6. Pick the herb leaves onto a chopping board and finely chop them, discarding the stalks. 7. Melt the butter in a small pan over a medium heat, then stir through the garlic and chopped herbs, then set aside. 8. Dust a clean work surface and rolling pin with flour, then divide the dough in half, then divide each half into 6 equal-sized pieces (roughly the size of a golf ball). 9. With your hands, pat and flatten the dough, then use a rolling pin to roll each piece into 12cm rounds, roughly 2mm to 3mm thick. 10. Use a knife to cut 6 lines into the centre of each round, leaving about 3cm at each end. 11. 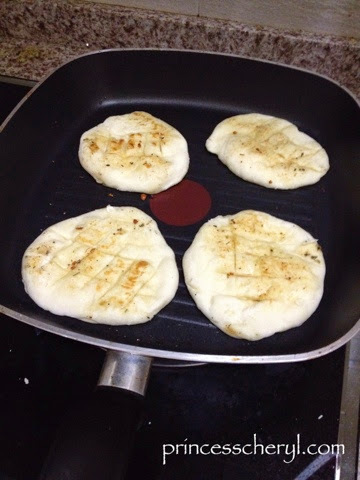 Place the griddle pan on a high heat, then once hot, cook each one for 1 to 2 minutes on each side, or until bar-marked and puffed up, turning with tongs. 12. Brush the flatbreads all over with herby garlic butter as they come off the griddle, then pile onto a serving board so everyone can dig in and help themselves. She surely enjoys eating the bread. So does everyone.